Listen to "Pistol: The Life of Pete Maravich" on your iOS and Android device. 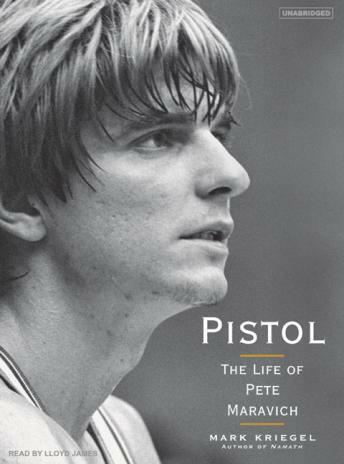 Pistol is more than the biography of a ballplayer. It's the stuff of classic novels: the story of a boy transformed by his father's dream-and the cost of that dream. Even as Pete Maravich became Pistol Pete-a basketball icon for baby boomers-all the Maraviches paid a price. Now acclaimed author Mark Kriegel has brilliantly captured the saga of an American family: its rise, its apparent ruin, and, finally, its redemption. Almost four decades have passed since Maravich entered the national consciousness as basketball's boy wizard. No one had ever played the game like the kid with the floppy socks and shaggy hair. And all these years later, no one else ever has. The idea of Pistol Pete continues to resonate with young people today just as powerfully as it did with their fathers. In averaging 44.2 points a game at Louisiana State University, he established records that will never be broken. But even more enduring than the numbers was the sense of ecstasy and artistry with which he played. With the ball in his hands, Maravich had a singular power to inspire awe, inflict embarrassment, or even tell a joke. But he wasn't merely a mesmerizing showman. He was basketball's answer to Elvis, a white Southerner who sold Middle America on a black man's game. Like Elvis, he paid a terrible price, becoming a prisoner of his own fame. Set largely in the South, Kriegel's Pistol-a tale of obsession and basketball, fathers and sons-merges several archetypal characters. Maravich was a child prodigy, a prodigal son, his father's ransom in a Faustian bargain, and a Great White Hope. But he was also a creature of contradictions: always the outsider but a virtuoso in a team sport, an exuberant showman who wouldn't look you in the eye, a vegetarian boozer, an athlete who lived like a rock star, a suicidal genius saved by Jesus Christ. A renowned biographer-People magazine called him 'a master'-Kriegel renders his subject with a style that is, by turns, heartbreaking, lyrical, and electric. The narrative begins in 1929, the year a missionary gave Pete's father a basketball. Press Maravich had been a neglected child trapped in a hellish industrial town, but the game enabled him to blossom. It also caused him to confuse basketball with salvation. The intensity of Press's obsession initiates a journey across three generations of Maraviches. Pistol Pete, a ballplayer unlike any other, was a product of his father's vanity and vision. But that dream continues to exact a price on Pete's own sons. Now in their twenties-and fatherless for most of their lives-they have waged their own struggles with the game and its ghosts. Pistol is an unforgettable biography. By telling one family's history, Kriegel has traced the history of the game and a large slice of the American narrative.